Though he lived more than two millennia ago, Aristotle (384 BC – 322 BC) is still considered one of the most influential philosophers of the West. His writings dealt with nearly every subject known to humankind at the time. Aristotle was born in Stagira, a town north of Greece. His father was the court physician to the Macedonian king Amyntas II, which helped Aristotle receive a good education. He went to Athens when he was 17 and studied under Plato for 20 years. After Plato died, Aristotle taught in Asia Minor for several years. Philip of Macedonia called Aristotle to Pella to tutor his son, Alexander, who was 14 years old at the time. Aristotle instilled a love of Greek learning in the young man and after Alexander conquered Greece and Persia, he financially supported Aristotle’s scientific researches. Alexander had his men collect biological specimens, observe them, and then send them to Aristotle. When Alexander became King in 336 B.C., Aristotle came to Athens and established his school in the Lyceum. He was soon recognized as the successor to Plato. Because he preferred strolling about the corridors of the Lyceum while he lectured, his students were called Peripatetic, which means to stroll around. They were called this for centuries afterwards. When Alexander died in 323 B.C., Aristotle left Athens and went to Chalcis, where he died a year later. He was about 62 years old. Of what material is it made? For example, a statue is made of stone while a dog is made of living cells. What efficient cause produced it? A statue was created by a sculptor and a dog by its parents. What is the form, nature or idea? A statue might represent “beauty” or “justice” while a dog’s nature is understood by biological processes. What is the final cause, or goal, of the process? The completed statue is the goal of the sculptor and the dog’s purpose is to be a fully grown and healthy animal. 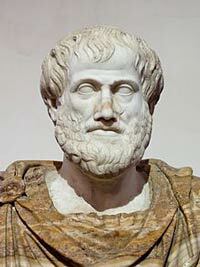 Aristotle also studied the philosophy of logic. His philosophy was different from Plato’s because Aristotle was more systematic than Plato. Aristotle was the first philosopher to closely examine a form of reasoning called syllogism. He was also the first philosopher to do extensive and organized research in natural sciences, including analyzing the fluctuations of both external and internal parts of animals as well as their heredity and movements. Aristotle also laid down the foundation of psychology by describing the conditions of a happy life for an individual and for society in his books on politics and ethics. He stressed moderation, or the Golden Mean, as the guide for organizing a virtuous life.